So this filthiness is very appealing to me, but he is a bit too easy-going and one-dimensional for a 90s rating. However, it is this combination that has just moved me to order two bottles, you can also chop in between times and the price-performance ratio fits. Blood oranges, an idea sulfur, beeswax and sherry right at the front. Longevity brings first of all lots of beeswax and clear barrel acid. The citrus notes are now interwoven with caramel and honey. From time to time, the alcohol prances about it, furniture polish, damp forest floor and leather are present in traces, actually it looks less complex and rather straightforward, even if sometimes flash other flavors very briefly, such. Fresh, slightly sour berries or sometimes a little sweat. That's always very short, as soon as you want to grab it, it's gone again. The sulfur provides a pleasant "dirtiness". He can not heat off so well, the spectrum is then compressed to honey, tartaric acid and menthol in a little flattering way. In the mouth it is nice and strong with a balanced mix of honey and spice, in addition to this sulfuric filthiness. However, you are looking for fruitiness in vain. The mouthfeel is slightly oily, towards the back the oak becomes relatively massive and also slightly astringent. The finish is quite long, honey and oak hold here the balance. It warms the chest area pleasantly. Chocolate, sherry, berry fruit on damp forest soil and a hint of tobacco rise into the nose. Earthy-mineral. Yes, also sulfurous. But I do not feel that as a false mark. Rather, it underlines the overall dirty-dark character. Brown sugar, again fruits and molasses, saddle leather. Getting sweeter. The alcohol is there, but does not bother, but rather adds a dash of menthol. Creamy-oily and heavy on the tongue. The alcohol occurs clearly. Heavy, dark sherry. Fruit, forest soil. Now astringent. Leather, espresso, men's chocolate. Again, sulfur. Significantly tarter than in the nose. Salt licorice. Tannins. The barrel seems to dominate. The fruit recedes behind the notes of age. Now also maritime hints: sea air, Tang. A little more mint, more fruit. Coffee powder, ginger and orange zest in honey. Slightly spicy on the palate, still ripe with licorice and neat oak. There are oak, espresso, leather and the memory of red fruits as well as some candied orange. Long, rather dry finish. Pleasantly strong, ripe and slightly dry. For me a complicated malt, freshly uncorked first time to breathe a few days in the bottle, especially on the palate, he has experienced for me during this time a very positive change. I had him regularly in the glass last week because I did not come to a clear judgment for myself. Finally, I had to buy a few more bottles, as he combines beautiful rich, creamy, flattering refill sherry with "sulphurous" aromas, which I like very much in Bunnahabhain Wy Viceroy Elixir and Deanston 20, and which combines with his own style at a modest price. The whisky is really nice when I'm just no sulfur swarm flies. The first time I thought my rabbit has gepupst. If it's not rainy, it does not stink. Then this is a great Beerenschmusie with make-up removal. Fits preheat. Funny practices in the forum. After I bought her bottle, I was deleted from them. No opinion by mail while I have requested friendly. There are more forums, I am in good spirits that in the other the stalkers and piglets do not immediately try to get my address out when I sign up for a split. 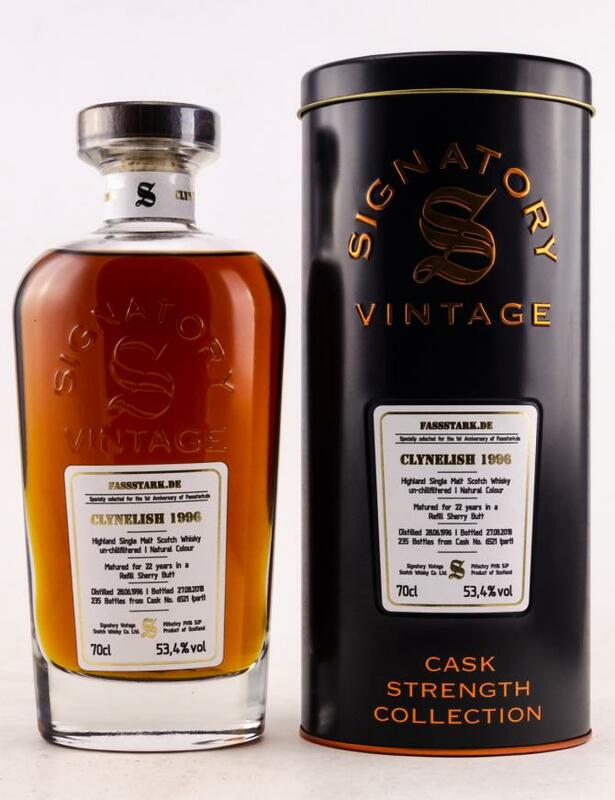 I am a Clynelish fan and despite the strong influence of the bass, I find the notes that I like here too, and complement the sherry notes very nicely. All in all a very good whisky that tastes best with a lot of time in the glass and with a little water! He is not quite up to the local dealer Clynelish, but he is very close. burned matches, dried plums, wild berry jam, raisins, damp forest soil, chocolate sauce, grape nut chocolate, coriander, old books, a little bit of menthol, nutmeg, old balsamic vinegar, candle wax (yes, finally, I was waiting for that, what would be Clynelish without the wax note, but it had to air for a while before I found it), orange oil, now cherries too. Wow, the nose is really great! hui, that pushes! Pepper and ginger warm the mouth, plus a lot of honey sweetness. Nice creamy, slightly dry, with leather notes, intense grape nut chocolate, orange peel, cherries with cardamom, Mon Cherie. With a little water, the colleague softens, without losing his strength. Water runs in the mouth and the warming feeling stays eternal, the chocolate gets darker, espresso is added and dried prunes. Warmth, spice and dark chocolate remain for a very long time, the dram gets drier and espresso notes are pushed forward. The nose is world class and impresses with its creamy and fruity sweet character. The first half of the taste seamlessly ties in with the wonderful nose, dominated by dried fruits and creamy wax or dark honey. Gradually, however, the sweet and fruity elements are shallow, dark and tart aromas appear. Decayed wood and forest floor, a touch of furniture polish and increasingly darker wood tones disappoint me a little, with again and again flash dark and dried fruit elements. The aftertaste does not quite meet my taste, he is a little too dark, harsh and bitter. I do not perceive sulfur, though the dark and bitter aromas could well be the result of a slight hint of sulfur. However, the whole package is definitely right for this varied and multi-faceted bottling, right now, right now, after another minute sip, I cover up new flavors and a new combination of flavors. This strong filling tastes and knows to persuade in spite of dark, tart and slightly bitter aromas! Strong and intense amber shines with a velvety red sheen in the Premium Snifter. On the glass wall sticks a syrupy streak from the long oily drops dissolve and pull their tracks into the glass. Dried berries and grapes mix with roasted aromas, creamy milk chocolate drips on sweet caramel and toffee. Discreetly appears musty and decayed forest soil, hints of ripe apricot and sweet vineyard peach combine with juicy cherries and dried orange slices to an incredibly fruity blend. Roasted hazelnuts and ground almonds dissolve slowly from sour cherries preserved in rum, my salivation is inevitably stimulated. Again show velvety vineyard peach and abrasion of orange peel, the nose is extremely harmonious and very well balanced, the alcohol is wonderfully involved. After this great nose, I am looking forward to the first sip. Sour cherries and old orange juice moisten the lips, creamy nut chocolate melts on the tongue, decayed pieces of wood stick to the palate while slowly adding wooden sharpness to the tongue and lush warmth floods the palate. Again, the salivation is stimulated, tart and slightly dry wood elements end in decayed forest soil, bitter and dark dark dark chocolate rises. 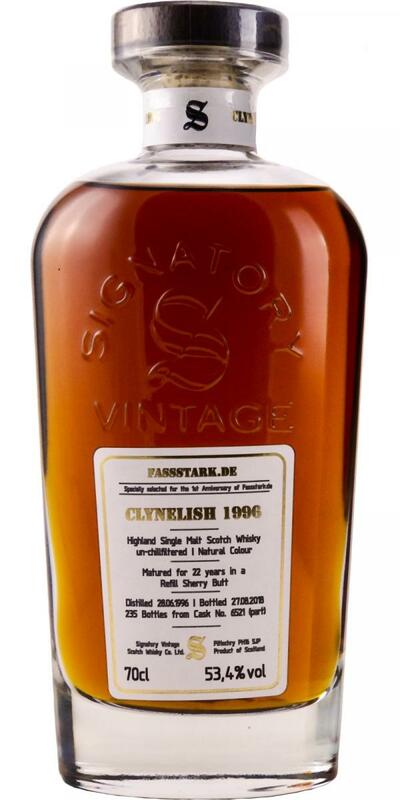 For the first time I can see the characteristics often mentioned in Clynelish: beeswax and honeycombs stick to the tongue, creamy and waxy sweet flavors stick in the palate while sour cherries and a touch of furniture polish slowly show. Likewise, more and more tart and dark wood tones in combination with peppery sharpness are noticeable. Cold deep black espresso flows over decayed wooden floorboards and drips on resinous forest floor, the tart aromas dominate the transition to the aftertaste. The dark and tart wood elements are still sticking to the palate, a mixture of heat, varnished or glazed wood and a pinch of pepper pull voluminously through the throat. Again, sour cherries, dark chocolate and zest of old oranges show up. Spicy and wooden, the dark fruit and wood aromas gradually fade, leaving a discreetly sharp film on the tongue. The nose is a dream, here Sherryfassreifreifungsliebhaber should get their money's worth. Beautifully balanced blend of fruit and spice, also on the tongue and on the finish. A dense, "thick" nose with a basket of ripe black cherries. Chocolate, nougat, leather notes and tobacco. Old wood, a little clay, moder. The idea of ​​an old oak cabinet full of antiquarian books pokes up. In addition to the black cherries now also dried fruits, raisins and (slightly sulfurized) plums. The notes of the dried plums fit nicely into the rest of the spectrum of flavors: complementary, not dominant. Mild herbs, spices like cinnamon, coriander, cloves. Pleasantly strong start. Creamy and oily at first, the whisky quickly lays dry and heavy on the tongue and completely covers the mouth with old wood, leather, tobacco, dark chocolate and honey. Almonds and nuts are added. The Honeycomb Clynelish kick is flashing, but has to be defeated the Sherry Keg. Also on the tongue a good portion of cherries, raisins and the slightly sulfurized plums. Spicy and oak-dry. Medium to long, dry, oaky. Still the almond note. In addition to the plums and raisins shimmer in the finish again and again with carnations peppered orange slices. Even when pouring sherry aroma rises, is literally in the room. Great color, amber with a stab in the red. Slowly, almost oily, the legs flow down the glass, forming even small drops. The expectations are fulfilled. Exactly my dram. Edit 03.12.2018: a second time in the glass to confirm the first impressions. With only a little water added, it opens, showing more fruity in the nose. On the palate, it is despite the cask strength also undiluted edible. the alcoholic sharpness at the beginning gives way quickly and releases fruit and sherry aromas, is voluminous and powerful, which also continues in the finish. There's an extra point for "Taste". Optimal he has tasted me with little water, max. a teaspoon to 2 cl. Oh, and no trace of sulfur anymore. In the nose intense Sherry, but not overloaded or overlaying everything. Chocolate, Ritter Sport rum or grape nut with fine raisins, ripe cherries, dried plums. Almost no alcohol despite cask strength. The perceptible alcohol gently transports the aromas to the nose. The nose on the upper rim of the glass then takes on sweetness, followed by orange peel, then a touch of oak, subtle spices, nutmeg, thyme. You do not want to stop smelling. Strong, heavy, oily, undiluted, the alcohol is noticeable, spicy with pepper, accompanied by sherry. The age makes itself felt, the dark fruitiness of the nose remains in the background, it becomes drier, tart. With water wonderfully soft, the fruitiness comes back a little, accompanied by a light peppery pungency, again orange, oak - and yes, maybe a hint of sulfur. The finish is long, the dryness fills the mouth and remains for a while. The saliva flows and transforms the dry, woody into fine coffee or espresso notes. quite dry and dry, now nuts are added, medium-long, with time the taint goes by and the raspberry comes through again.